Connevans is a family run company now 50+ years old. 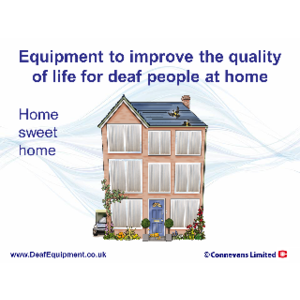 We are a commercial company with an unrivalled online shop: www.DeafEquipment.co.uk As state funding for support services decreases we increasingly see that people turn to us for help and advice with equipment solutions. This website is our information store. We realise that if we can help you identify equipment solutions then hopefully you will place your order with us! Click here to watch our introductory video which shows the range of products that you can use all around the home! Unlike many companies we do have a team of humans that you can contact by phone, minicom or email. If you are contacting us about existing equipment please ensure that you have the precise details of both the product and when you purchased it from Connevans Limited. If you are contacting us about a problem you would like some equipment to help with then I would like to think we can help in some way. Connevans can make electrical and electronic items for you from PCB to complete unit, including one off prototypes. Anything you need can be built and tested in-house. Small runs are a speciality, if you need one or a hundred of something, we are the people who can help you. No minimum order quantity, no waiting for shipments from overseas, everything we make is made here by our UK based staff who you can talk to personally.